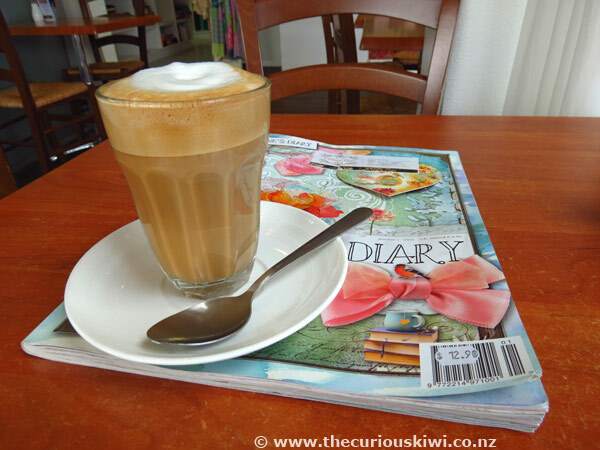 Rotorua Cafe Guide is written with visitors to Rotorua in mind, we've included cafes that we think visitors will appreciate. 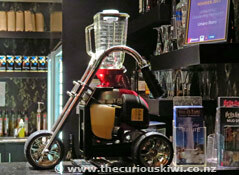 In keeping with our unusual theme we have noted the unusual aspects of each cafe. 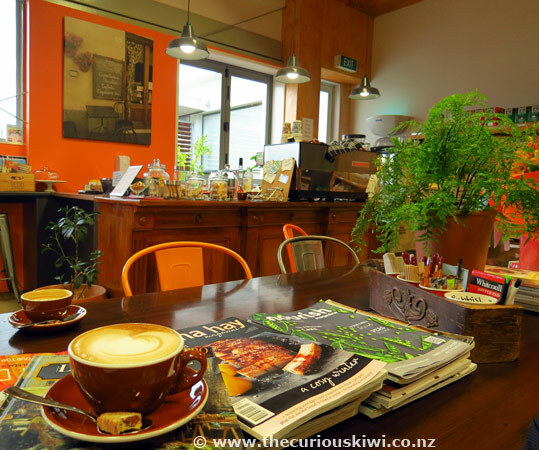 Coffee chains like Starbucks and The Coffee Club aren't included because they offer similar experiences country wide, but we have noted their locations at the end of the guide. With the exception of Urbano Bistro all of the cafes are in the Rotorua CBD. 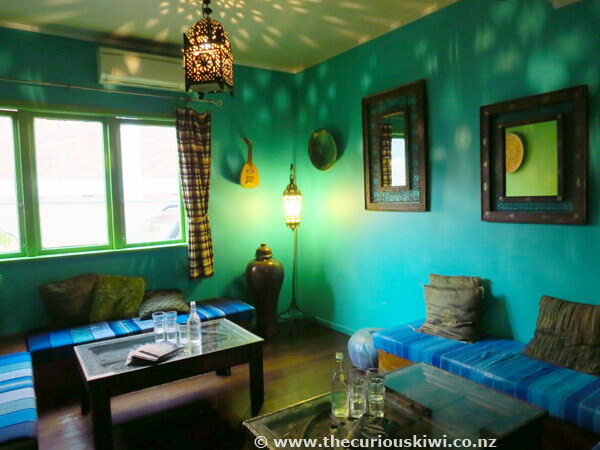 Abracadabra Cafe & Bar is more rustic in style now, rather than Mexican and Moroccon themed, but it still has the three colourful rooms. Opening at 10.30am for brunch, dishes include burritos and tortillas, as well as brunch staples like creamy mushrooms (recommended), and bacon and eggs. 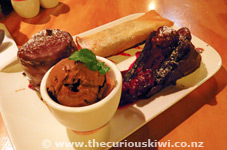 Abracadabra has an extensive menu including tapas, salads and Kai for Kids. Hours - closed Monday, open 10.30am - 11pm Tuesday-Saturday, 10.30am-3pm on Sunday. Free Wifi. What's unusual? 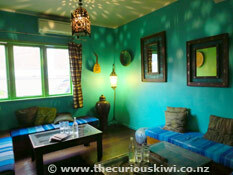 The three colourful rooms that are ideal for small groups meeting over coffee or Mexican hot chocolate and snacks. 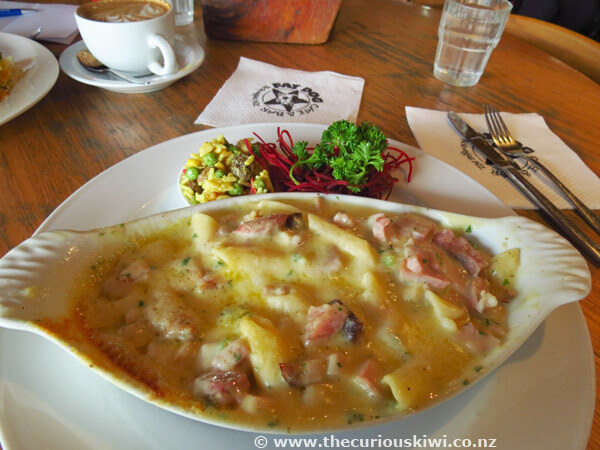 Abracadabra is part of the Conscious Consumer network and uses free range chicken and eggs. 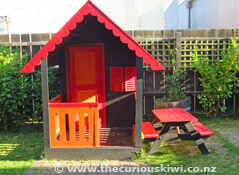 There is a sweet little play house for kids in the garden bar. 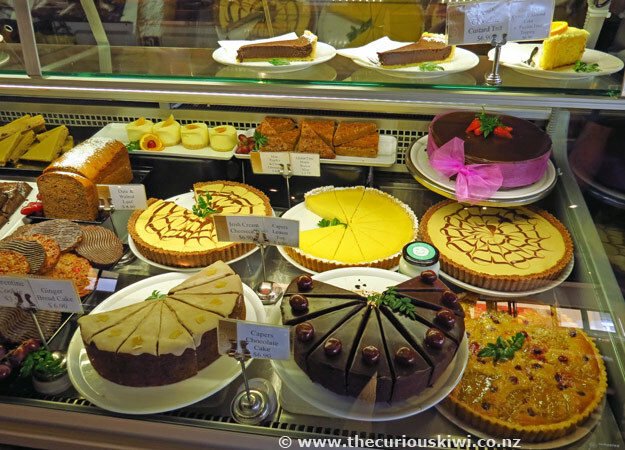 'Let's go for cake' is often said at our place and one of our favourite destinations is Capers Epicurean, we especially like the lemon tart and orange friands. 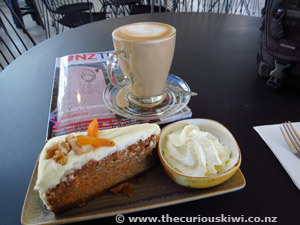 The cafe is open until 9pm so it's a good spot for a late afternoon coffee or a well priced dessert after dinner. Capers is a big cafe with lots of seating and it's popular with locals, we think the prices are a bit high for the salads and savoury food in the cabinet but the cafe's popularity says otherwise. Open 7 days from 7am for breakfast, lunch and dinner. Free 90 minute parking at the door. What's unusual? 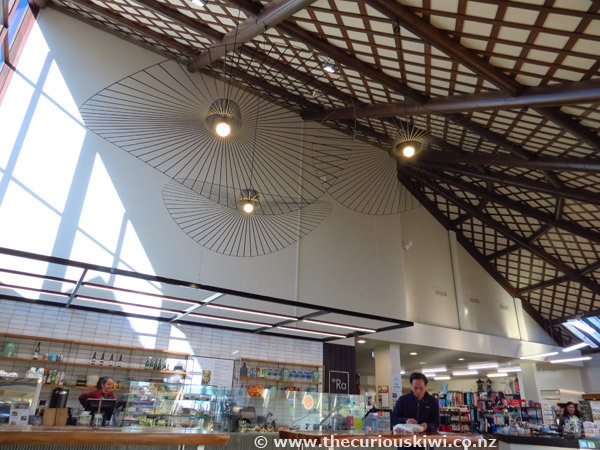 Capers have their own range of jam and chutney, and sell packets of native wild herbs like Kawakawa (Maori bush basil) produced by Chef Charles Royal. Other NZ and imported food items include honey, chocolate and tea. There is a mirror over the coffee station so you can watch the barista at work, and a little play area for children. 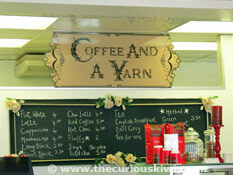 If you're into crafts and like to take your knitting to cafes, Coffee and a Yarn is the perfect spot. You'll find scones, slices and sandwiches to snack on and may find inspiration in Daphne's Diary. Non crafty companions can read the Herald while you browse in the adjoining Cottage Flair for craft supplies. Coffee and a Yarn is open Monday - Friday from 8am - 3pm, 9am - 3pm on Saturday, closed Sunday. What's unusual? 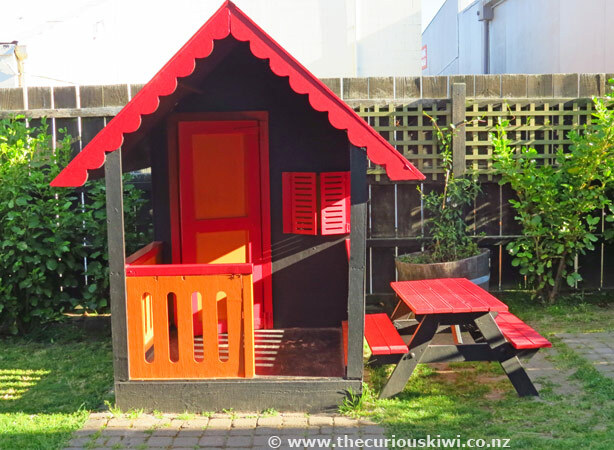 The adjoining Cottage Flair (relocated from Ngongotaha) runs classes and events. The shop also sells fabric, wool, quilting supplies and patterns to make unusual dolls like High Octave Hester, there is a display of the dolls in store. The focus at Fancy Meow Cat Cafe is the cats rather than food and drink. It costs $15 to spend an hour with the cats and the cost includes a hot or cold drink. There is no fresh food to buy but there are packaged snacks. 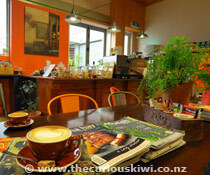 Check Facebook for current opening hours. What's unusual? 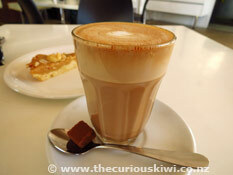 The cats, and they're fancy breeds like Ragdoll and Bengal, see Fancy Meow Cat Cafe via thecuriouskiwi/blog. 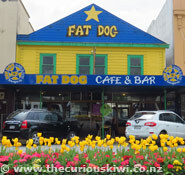 Fat Dog Cafe is one of Rotorua's busiest cafes and it's run by a cheerful crew of staff. 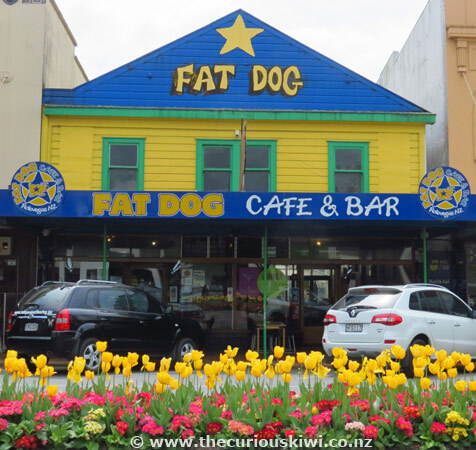 There is a LARGE menu with servings to match, if you're ravenous try the Dogs Bollox Burger. If you're looking for a cheap and tasty lunch you'll find it for $10 without a side salad, $15 with. 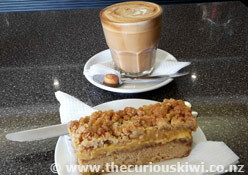 Latte bowls are $4.90 and there are equally large sweet treats in the cabinet. Open 7 days from 7am for breakfast, lunch and dinner. Free Wifi and no surcharge on public holidays. What's unusual? The quirky decor of paw prints, poems and cartoon dogs. 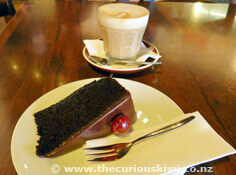 If you're looking for a chocolate dessert big enough to share try Death by Chocolate. 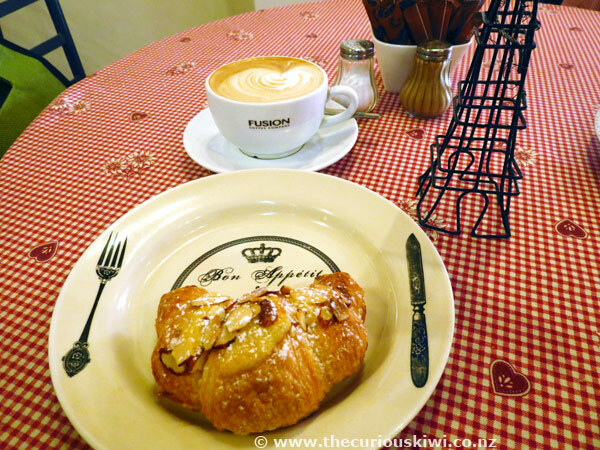 I receive a hearty 'bonjour' when I walk into Le Cafe de Paris and that's reason enough for me to return. 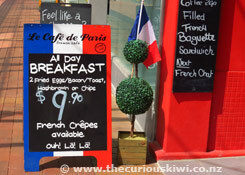 Gluten free galettes (savoury crepes) and sweet crepes are made to order for around $10. Croissants, macarons and pain au chocolat are in the cabinet, and there's a $9.90 all day breakfast. 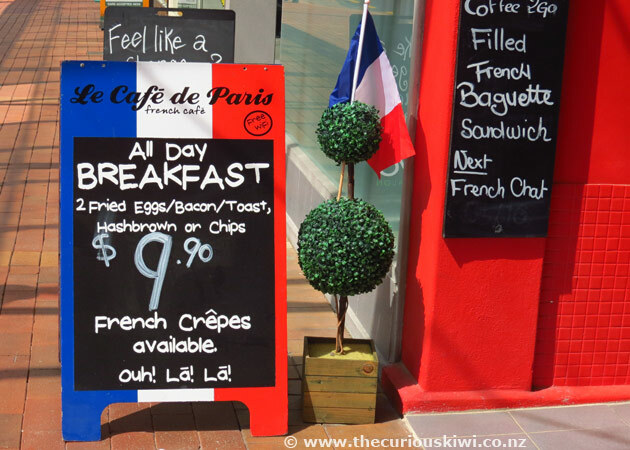 Le Cafe de Paris is an informal and friendly cafe with French memorabilia throughout. Open Tuesday - Friday 7.30am - 4pm, Saturday 8am - 3pm. Free 90 minute parking at the door. What's unusual? 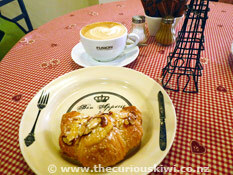 Practice your French when placing your order, or attend a French chat session - see Facebook to confirm dates and time. Snails and foie gras are among the small selection of French products for sale. 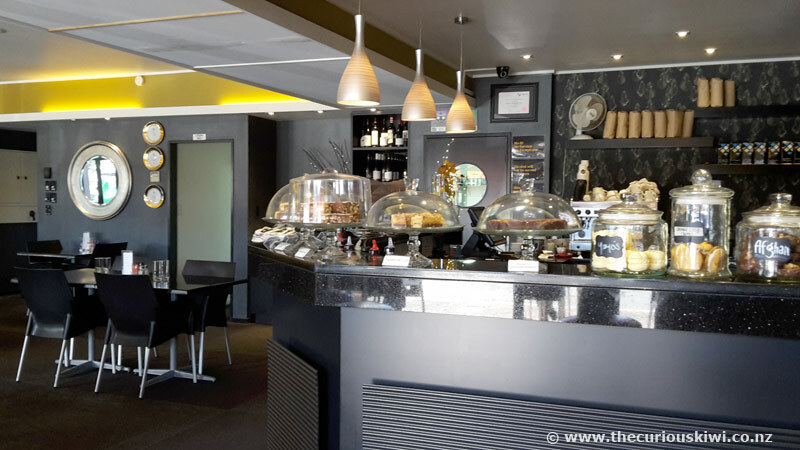 Lime Caffeteria adds some sparkle to the Rotorua cafe scene with its shaded chandeliers and classic black and white interior. 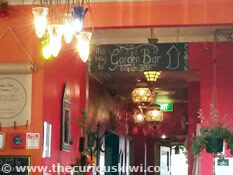 I like the marsala mushrooms on the brunch menu, and Mike's choice for lunch is usually Thai green curry risotto. 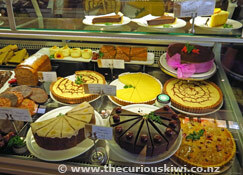 There is a tempting selection of sweet and savoury treats. Lime is a short walk from the lake front and opposite QE Health Spa. Open 7 days from 7.30am - 4.30pm. Breakfast/brunch served 7.30am - 3.30pm, lunch 11am - 3.30pm. What's unusual? Lime is licensed and R18 Baileys Hot Chocolate is on the drinks menu. There are plenty of tables and chairs outside to enjoy the sunshine. Why is the cafe called 88Ra? Bathers or those 'taking the waters' in Rotorua in the early 1900's could soak in water 'activated' by radium borax. At the time it was thought radium had energizing properties, but by the 1940's radium's dangers had been discovered. Needless to say you won't find radium borax in the water at Polynesian Spa these days but 88 is the atomic number for radium, and Ra is the symbol for radium, so 88Ra it is. 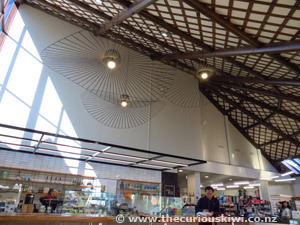 The cafe is an open, airy space with a pitched ceiling and large black wire light fittings and black wire tables and chairs. There is also a long communal wooden table that seats at least 16. 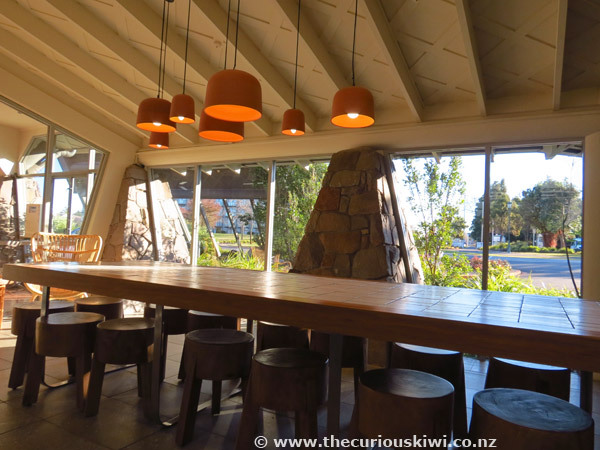 Large green plants bring the outside in, and there is also a courtyard with geothermally heated concrete bench seats, although the benches haven't been warm on my few visits. Food in the cabinet includes salads, slices of pizza, sandwiches, wraps, scones and muffins. 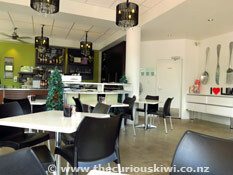 If you prefer something cold after a hot soak you can have a cone of Kapiti ice cream or Carrello gelato. Local Volcanic Hills wine and Croucher beer is on the beverage menu along with Garage Project beer. What's unusual? In keeping with the Polynesian Spa wellness theme there are fruit and vegetables waiting to be blended into a dozen types of juices and smoothies ($7.50). The geothermally heated concrete bench seats in the courtyard (if they are working). Note: You don't need to pay the entrance fee to Polynesian Spa to dine at 88Ra Cafe, the cafe is located in front of the spa entrance. 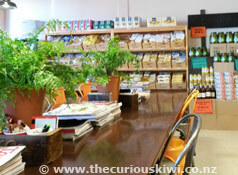 Scope – Wild About Flavour, add the hunting magazines on the rack and you have a few clues that wild food is a theme here. 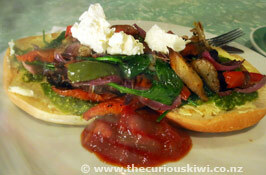 The menu includes a Mai Mai Duck Open Sandwich ($23) and a Venison Burger ($23). Venison and blue cheese pasta is sometimes on the specials menu, and a venison sausage is part of the Hungry Hunter Big Breaky ($23.90). 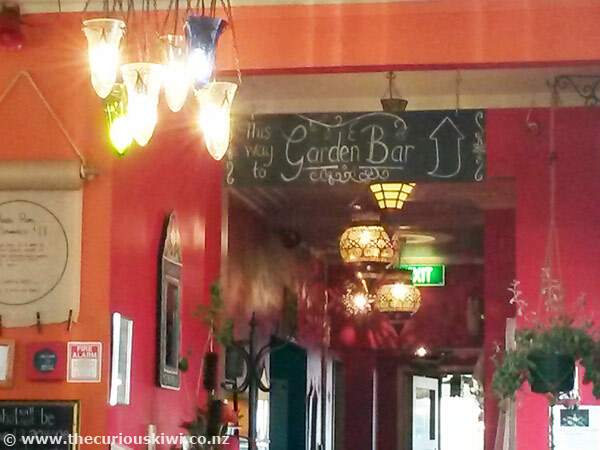 Read the rest via thecuriouskiwi/blog. 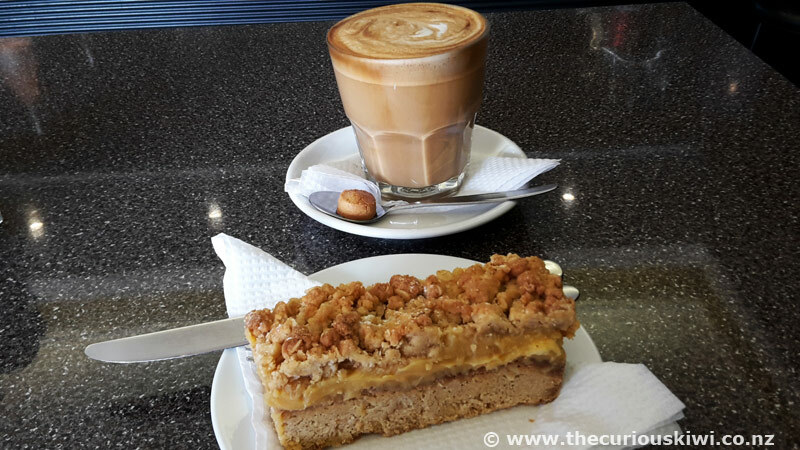 Urbano Bistro is a stylish cafe by day and bistro by night. Brunch is served every day from 9am and it's also a good morning or afternoon tea stop as there is always a selection of good looking and substantial slices. 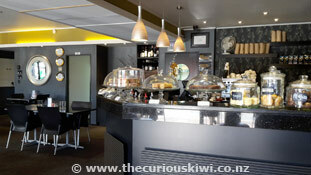 Urbano is just under 1km from Rotorua Central Mall and is opposite Rydges Hotel and Executive on Fenton Motel. Open Monday - Saturday 9am - 11pm and Sunday 9am - 3pm. Free parking. (We also recommend Dinner at Urbano Bistro via thecuriouskiwi/blog). What's unusual? 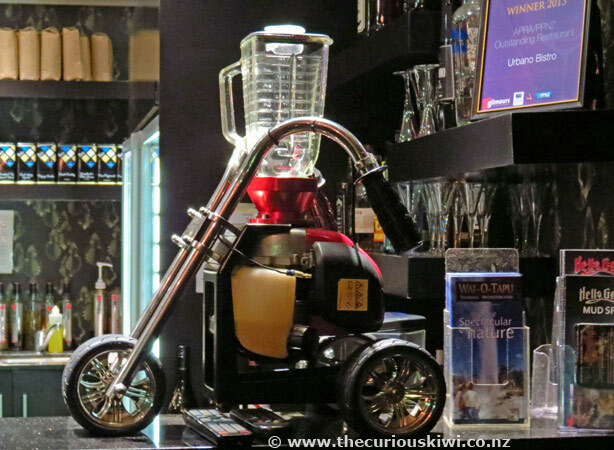 The cool motorbike cocktail/smoothie maker on the counter. Urbano currently pops up on Bookme with breakfast and dinner specials. Revolver Espresso is tucked into the back corner of Vetro Mediteranean Foods. 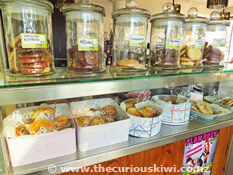 The cabinets at Revolver are filled with muffins, croissants, cakes and ciabatta rolls. Vetro's shelves are stacked with dried fruits, French cheese and wine, pasta and other food from the Mediterranean and beyond. Revolver is open Monday - Friday 8.30am - 3pm, Saturday 9am - 2pm, closed Sunday and public holidays. Free parking. What's unusual? 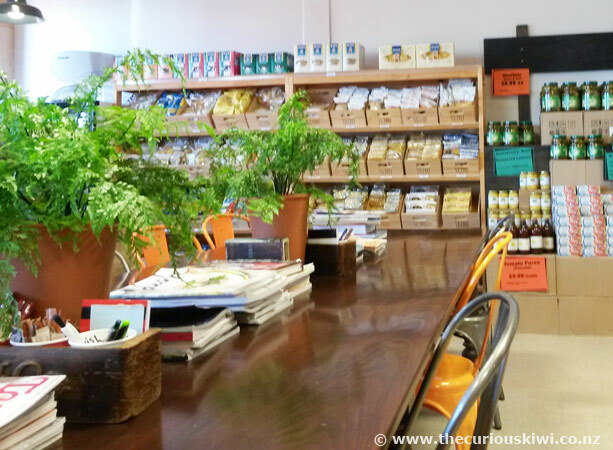 In keeping with the food theme there is a communal table stacked with cooking magazines, and cook books by Rick Stein, and home grown foodies like Nadia Lim, Annabel Langbein and Cameron Petley. Snap a recipe with your phone or BYO paper - pens provided. 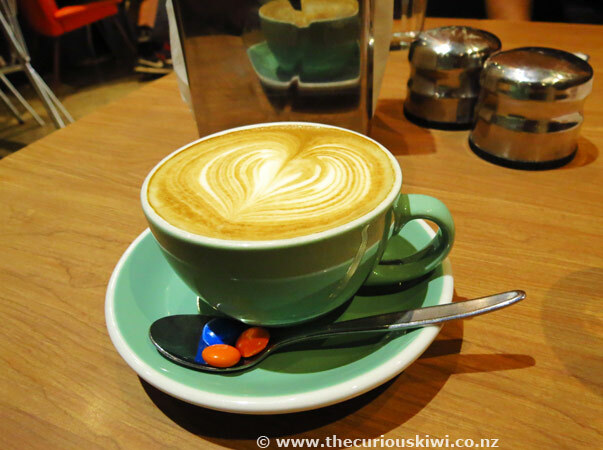 At Zippy Central coffee comes with M&Ms on the side and there's a blackboard menu of more than 10 bagels to choose from. The roasted vegetable bagel with pesto, feta and relish is scrumptious and good value at $12 (see photo below). 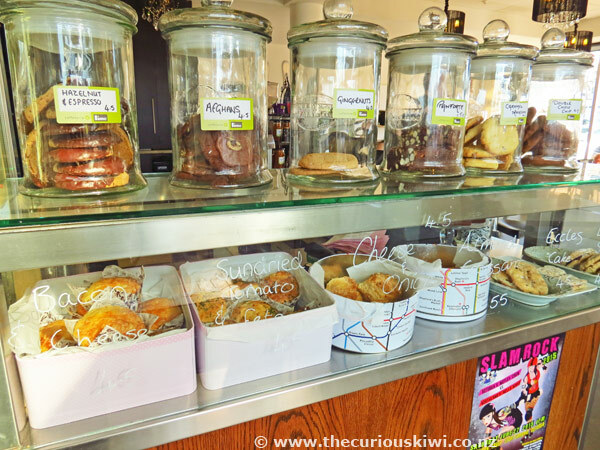 There are muffins and snacks on the counter, and a menu of mains served from 11.30am. Zippy is a colourful cafe with a graffiti style wall, booth seating and retro tables and chairs. One of the things we like most about the cafe is the decor always looks clean and fresh, just like it was finished yesterday. Zippy is popular with mountain bikers and there's a bike rack outside, 90 minutes free car parking at the door and free Wifi. Serving breakfast, lunch and snacks in between. What's unusual? 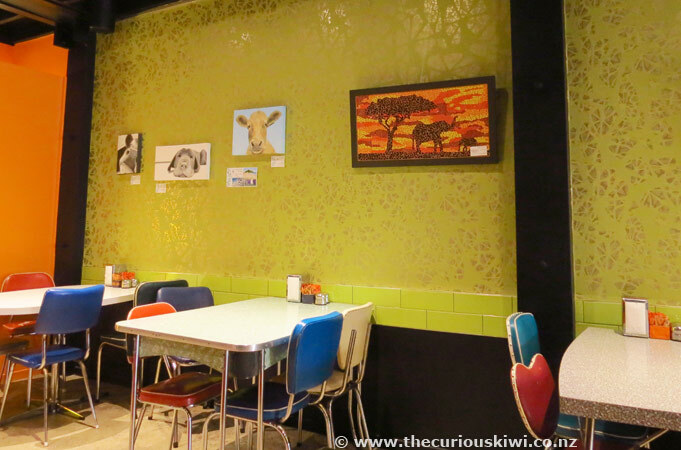 As well as the bright and funky decor there's a fruit bowl made of carrots behind the counter, and interesting art work on the walls.